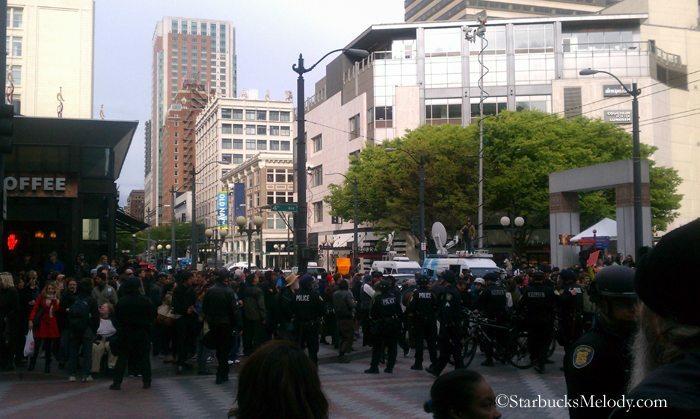 There were still plenty of protesters and police, and it seemed like most of the action was along Fourth Avenue between Pike and Pine. I took the above photo at about 5:45 p.m., at the intersection of Fourth and Pine Street. I tweeted the above photo and so there is a slightly larger version of the same photo here. 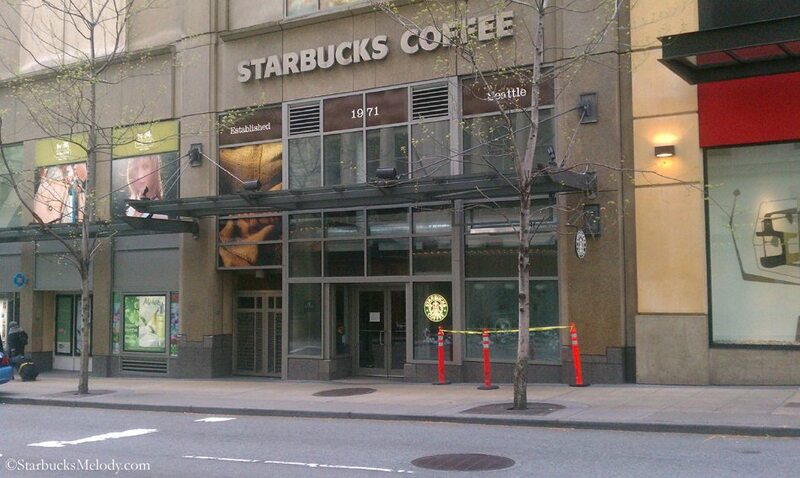 Needless to say, the Westlake Center Starbucks which sits right at that corner was closed for business. There was tons of news of violence today. I happened to miss most of it. I arrived at work long before it started, and walked home after most of it ended. I read in the news that protesters smashed out windows of businesses such as Nike, Wells Fargo, U.S. Bank, American Apparel and more. There’s a Seattle Times article about this here. 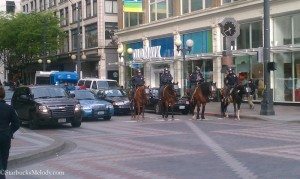 Seattle is mentioned in this msnbc.com news article about May Day protests. 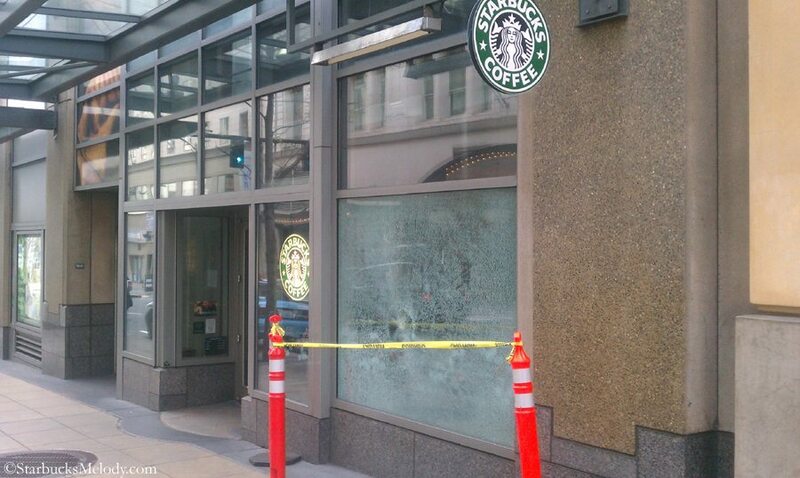 Along Sixth Street, I discovered that one of my favorite Starbucks had a smashed out window. Technically that Starbucks has a Pine Street address because it is connected to Pacific Place Mall, but its entrance is on Sixth. By the way, the above Starbucks is the same one that I featured in this blog post here: Featured Clover Store: Pacific Place Starbucks. I really like that store. The partners there have always been super friendly and nice, and the manager absolutely cares about the experience for both his partners and the customers. I realize this is an usual blog post for me. As I walked home, I was so struck by these images, that had to put my pencil to paper, so to speak. Perhaps I am just of the wrong generation, but I don’t understand many modern-era protests, and especially have zero tolerance for those that turn violent. The way I see it is this: You (and me too) may be part of the 99%, but really, 99% of our problems are first world problems. Breaking windows won’t make the world better. Mocha Cookie Crumble Frappuccino arrives today. @Frappuccino Happy Hour is 5/4 - 5/13. 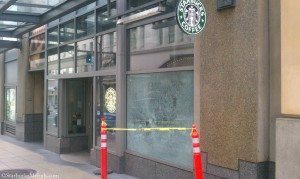 Spotlight on the Starbucks Undertow. Thanks for sharing this. I completely agree. To protest is fine but do it peacefully. It’s when things get violent that people are certainly not helping their cause but rather harming it. And at the risk of someone saying something negative… You are right, these are first world problems aren’t they? I certainly know third world problems and these aren’t even close. I should mention, just because I say this, doesn’t mean I am not apart of the 99% but rather don’t feel it’s necessary to break windows to get my point across. Let’s find a better way. Truly disgusting and horrifying and I fear it will only get worse as the election year drags on. Violent protests do not bring public sympathy to a cause. Just vile to see public property and people hurt. It is a shame that when people try to get their message out there that they have to do it in a way that defeats the objective. @Melody — as Veterans you and I probably have a different perspective on protest and rights. This is not anything but destruction by hoodlums and anarchists. As one who has been at the wrong place at the wrong time during race and political riots in Chicago in the 60s and spit on when in Uniform during the 60s too, the older I get the angrier I get. I have spared you all the rage of an old Veteran who has sworn an oath to Preserve, Protect, and Defend the Constitution of the USA. I may be out, but when I mustered out my debrief did not include giving up my oath. We all need to follow the admonition that is the cornerstone of being a Marine, Semper Fi (Always Faithful). Thank you Brothers and Sisters. I thank God every day for the blessings I have received and the children I have raised who know what is right and what is not. These subhumans need to realize that their actions speak so loud that their words are never heard. I wish you all fair winds and following seas. Peace. Out. I’m really glad you posted this Melody. Like DadC…….but not as a veteran…..I went thru the political and race riots in Chicago in the ’60’s. We had 500 National Guard troops stationed in my h.s. gyms (Austin H.S. west side) in April ’68 when King was killed. What a hell of a yr. I was 15 then…and it only got worse. When I see these “protests” and hear some of these kids being interviewed, I think: it’s a whole different thing to be a part of a RIOT that you are victim to/in…..and these STUPID idiotic examples of, apparently, having nothing better to do. MAKES ME REALLY ANGRY AND SICK! Every time I see this on the news, I think……you should be so grateful! and instead you’re out here creating hell and damaging whatever you feel you’re ENTITLED to! They, (I assume most of them) have NO idea what it is like to be in REAL violence….such as war (thank you, all veterans) or the riots of the 60’s that DadC… and I described. It all just makes me SICK. @DadCook’s words need to be repeated: their actions speak so loud that their words are never heard. I thought it was odd that American Apparel was targeted in Seattle, as their Los Angeles HQ closed so workers could participate in the Immigration March (there were numerous marches) here. The CEO even marched with the workers. But then I read it was Anarchists….so it probably doesn’t have to make sense. The NATO summit is coming to Chicago in a couple weeks. Thank God the G8 Summit took a pass on Chicago. I’m sure what happened in Seattle will pale in comparison to what may be coming. I was fortunate enough to be a baby when the riots broke out on the West Side of Chicago. Growing up in the same area as Denise, I was lucky enough not to personally experience what went on back then, because I wasn’t aware of what was going on. Denise knows first hand what happened and DadCooks probably experienced it from a distance. Ground Zero for the riots in Chicago was very close to where Denise and I came from. It was a volatile area during a volatile time. Let’s not forget that Chicago rioted over the Bulls winning Championships in the early 90’s. Things will get interesting here soon. Chicago has always been the heart of the Labor Movement. 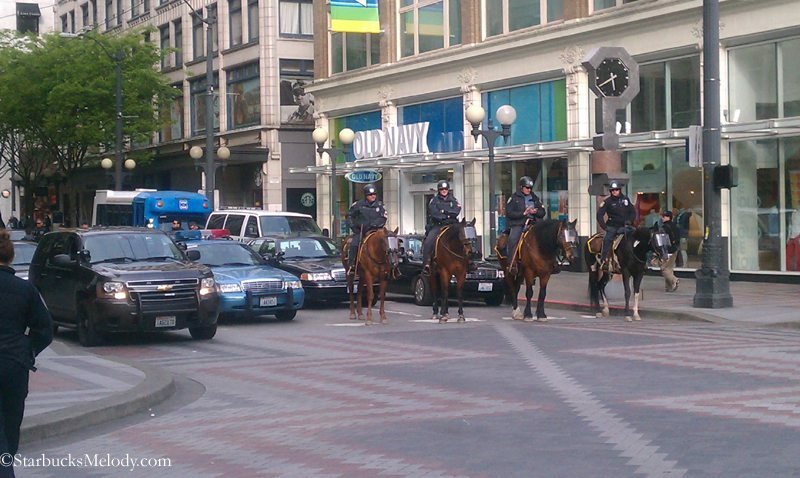 Yesterday was relatively peaceful on May Day. I pray things don’t get out of hand in the next couple of weeks. My husband is a police officer and it sickens me to see the officers suited up in riot gear trying to do their jobs and not get involved in a civil lawsuit at the same time. Totally agree with these comments I’m reading—I have no respect for protests turned violent. Absolutely agree with Denise. Too many people walk around feeling entitled instead of thankful. What purpose does destruction of property serve? Baffling. And DadCooks, you are 100% correct. Couldn’t have said it better myself. That anyone would ever spit on military personnel makes me sick. Anyone who serves my country, fights for my country and myself, deserves nothing less than my utmost respect and appreciation. God bless.